PA source says Abbas rejects Israeli security presence in 'Palestine' along Jordan border, formally refuses to recognize Jewish state. A Palestinian Authority (PA) source on Friday told AFP that PA Chairman Mahmoud Abbas formally rejected US proposals for Israel to keep troops in a future Palestinian state along the Jordan border. The source further formally stated Abbas' position of refusing to recognize Israel as the Jewish state. Abbas' rejection of US Secretary of State John Kerry's proposals in Ramallah Thursday night came after similar remarks to a public radio station earlier in the night. 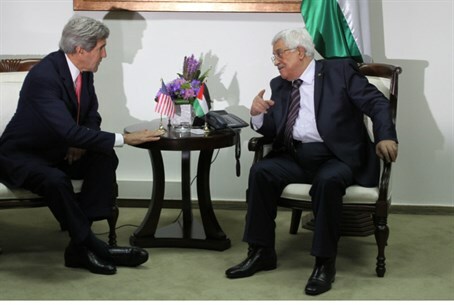 The PA source confirmed Friday that Abbas "has rejected the ideas" presented by Kerry. The source also revealed that Abbas had given Kerry a letter on "Palestinian red lines," which include his "refusal to recognize Israel as a Jewish state." In November, Prime Minister Binyamin Netanyahu remarked that the root of the conflict is the PA's refusal to recognize the Jewish state of Israel. Allegedly Abbas "rejected the ideas on (Jordan Valley) security because there is not a third party" to monitor the border. Such an arrangement has been opposed by Israel, and according to analysts even a limited security presence in the area would be a "death-trap" for Israel. Kerry, who was set to meet Netanyahu in Jerusalem Friday morning, changed his plans to continue on to Jordan due to the heavy snowstorm, instead heading straight to his next stop, Vietnam. Kerry, who just turned 70 years old, was in Israel on his ninth trip since March, the second in less than a week.